There are days when I’m attempting to play catch up on all the promises I’ve made, especially the ones to myself. Days when I feel the burden of guilt for not getting posts out by the schedule I’ve promised. It’s easy to think that I’m ever so important, that you’re hanging on to my every word. Gratefully present in the present? It’s easy to look back with regret. Asking myself a whole series of questions about the bad choices I’ve made at some point or the other. Wondering why I allowed myself to be manipulated in some relationships. Remembering hurtful incidents or times when I’ve been rejected…. It’s easy to look forward with fear. Wondering what will become of me if I was left alone. How would I manage if I fell ill or was bedridden. Fearful of who will look after us when we grow old. Anger, fear, regret, hurt, can become the currency I deal with every day. Comparing myself with another and wondering why I can’t have the life she has. So easy to lose sight of all I have. To take it all for granted. To feel entitled. What is sometimes the hardest thing to do is to be present in the present. Marvelling at the preciousness of life. Savouring experiences of good food, good weather, sunshine and rain. Being grateful for the abundance of all I have. Today I will be gratefully present in the present. Today I pledge myself to these words……. Also linking to Mackenzie Glanville’s post. 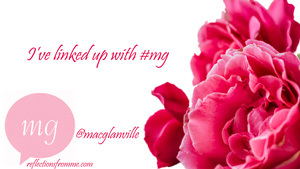 I understand, MG. I’m learning too. Beautiful words Corinne – yours and Maya Angelou’s. It’s so easy to let our busy brains distract us from the joy of each moment. Thanks, Tamuria. Yes, that monkey mind is always hard at work! Beautiful words of inspiration by Angelou….It is one of the hardest things to do – to strip the present of past anguish and future anxiety. Those who can do so are truly happy. Hard, but thankfully not impossible and so worth trying, Sunaina. I have been reading a book on Tibetan Buddhism for quite sometime and one of the important lessons it imparts is ‘Our present is a function of our past and our future depends on our present and since in this scenario the present is present twice thus it commands the most attention. 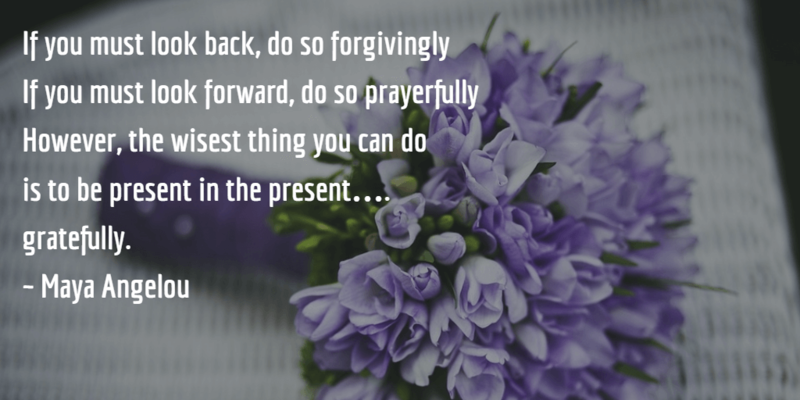 The wisdom in Maya Angelou’s quote adds gratitude to the living in present. Speaking from experience, gratitude has immense power. It heals from all the past hurt, fear and anger and it makes it easy to stay present. Ah love the reasoning of that quote, Anamika. Thanks for sharing. Such beautiful words by Mary Angelou. Loved this post. I read your post and have been nodding in agreement all along…all too often we are taken back and forth into the ‘what-could-have-been’ and the ‘what-will-be’, that takes away from us the conscious living in the moment. I am there, every single day, trying hard to stay focused on the present. Not giving in, anytime soon, no matter how tough! I can see that you are trying, Esha and it seems to be working. I told you the other day how your person exudes peace. No coincidence, methinks! Maya Angelou’s words are so inspiring. We do fear the unknown , the future – what will happen, if I do a mistake yet again. But it is equally important to live and be in the present and live the present to the fullest! Yes, the future scares many of us, Tina. Hence, the flourishing business of astrologers and soothsayers! Juts read Vidya’s post on self – pity and now yours on being present in the moment. Together they put things in such clear perspective. It can be absolutely liberating if we remember to appreciate the now and free ourselves from the fear of tomorrow or the regret of the past. Somedays a reminder like this is exactly what one need. A powerful qoute pulling us back into the present from the realms of Past and Future. Make present beautiful and everything will be fine. Thanks Corinne. Yes, it will, Upasana. Sending you light and love. That sure was a lot of food for thought! It happens to me too when I think of having a life that others have and learns it no time that it won’t get any better for the path I’m wishing for. Comparison really is the thief of joy, Geets. That’s such a wonderful quote, Corinne..Sometimes we ask the wrong questions and end up going deep into the wrong side…I don’t know what to say because I’m trying hard to be in the present but I’m not getting any time to stop and think. Not been a great couple of days really and I feel sometimes that I’m sinking ..Ahh well that’s me! I think your recent post on mindfulness shows that you’re getting there, Naba. It’s a journey, but I’m glad we’ve started. What a lovely thought to start the week with – thanks for sharing this Corinne. 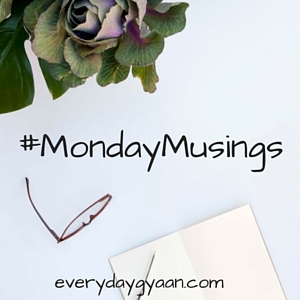 I just wrote a Monday microblog and realised I could have just as well included that in this linky. Shall remember from next week onwards as I plan to make it a regular thing. Thanks, Raji. And if we look forward, we must do so with joy! It’s been my experience that living in this moment is really the only way to live fully and happily and peacefully. The past cannot be changed, good or bad. The future is not a promise, the next moment of life is not promised. This is all we’ve got and it is beyond precious. I live in His grace, by His grace. That’s all I know. Thank you, Karen. Yes, gratitude and grace – two things that keep me going too. I love that quote and it is so important in whatever we do. Being present helps us in more than one way. What a timely reminder this is for me too, Corinne. Thank you! Many of my favourite quotes comes from Maya Angelou, Parul. Glad you liked it too. Your post reminds me of the dialogue from the movie Kung Fu Panda on present being a present. I love the quote here. We are so worried about what may happen tomorrow and what had happened yesterday that today looses its importance. Although I try, my over thinking mind doesn’t help me much. But I am trying. I’m flattered that this reminds you of a Kungfu Panda dialogue. Love that movie. May both of us learn to stay present in the present. Thanks for the tap on the head with your post “Gratefully Present In The Present”. Sometimes reading all the hyped Monday Blues post can sure make a great Monday seem horrible.